My name is Teannarose. I live in N.W. Oregon. 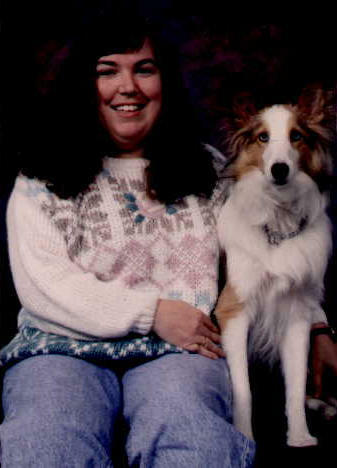 When I'm not spending time with my beautiful friend Shianne the Sheltie, I'm usually spending time with my friends and family doing lots of neat stuff, such as watching movies, reading, listening to music, playing outdoors (weather permitting--remember, this IS Oregon! lol), I love helping children, and taking care of them, messing with my computer and just about anything else as long as it's FUN. This is a picture of my Assistance Dog Shianne and I. He is very special to me. You see, he has been trained to help me with things that I have a hard time doing due to my disability. He takes great joy in helping me pick things up, pulling up my blankets, and just making my life fun and happy in his own loving way!! He is truly a gift from God!!! I know I am truly lucky to have him. If you're a dog lover, click our picture to read an incredible story. I also volunteer my time a couple Saturdays a month with a group of AWESOME kids. The group is called Winners On Wheels. (W.O.W.) It's a group of children with disabilities whose pledge is to "be the best that I can be". The group, who's theme is based on racing, award the kids with "wheel" badges for different achievements that they master. Each child has a backpack that symbolizes a racing flag, they display their badges on this with pride. There are local chapters all across the United States. Please, take a moment out and give these great kids some recognition. Click on the links below to visit the sites! Bolton Boulevard-- Lot's of great links! Please click on the cats eyes to see a Very Special Page! WiseHearts! Universal Hope For A WiseHearted Planet! Click and check this site out! My buddy Sapph sent me a flower! Click the banner above to view my Friends' pages. Click the banner above to view Awards. Please report any dead links Here. Remember to tell me which page you're reporting on.